L.A. Dance Project, co-founded in 2012 by Artistic Director Benjamin Millepied, began its first engagement at the Joyce Theater with four pieces that showed the company’s dancers off well, but in other respects was a mixed bag. Aside from including a set of three duets by Martha Graham culled from her 1957 documentary film A Dancers World, the program’s other pieces were Harbor Me, by acclaimed European-based choreographer Sidi Larbi Cherkaoui, the New York premiere of Helix, choreographed by New York City Ballet soloist and resident choreographer Justin Peck, and the U.S. premiere of Millepied’s On the Other Side. Helix is the most successful of these three, even if its specifics are not as easily remembered as the Millepied piece. And Harbor Me should find shelter elsewhere. On the Other Side, which had its world premiere at Sadler’s Wells in London a month ago, is a perplexing piece of work mainly because it invites a viewer to view it in one way, and then suddenly seems to change its focus – or never had a specific focus to begin with beyond creating dances to fit the assembled Philip Glass music – and become something else not nearly as good. Initially a bit of background that may or may not be relevant. In 2004, Millepied, then a NYCB principal dancer, created a pas de deux titled On the Other Side, performed by Janie Taylor and Jared Angle. [The YouTube video note indicates that it premiered – coincidentally or not – also at Sadler’s Wells, and was uploaded by Millepied himself in 2008.] It’s a lovely duet made even more thrilling by Taylor’s fragile, weightless presence. Unlike the dance performed at the Joyce, this piece used projected images of the dancers on the upstage backdrop and may have utilized a different excerpted score. And the choreography in the 2004 pas de deux is not duplicated in the current incarnation of this piece – although I recall one duet that, in hindsight, might have been close to it (none of the LADP dances could possibly duplicate Taylor’s ethereal quality – which might account for anything choreographically similar looking quite different). Regardless, the program notes and publicity materials do not mention this earlier duet with the same name. Another interesting aside is that On the Other Side (this incarnation) is the third in a trilogy of pieces commissioned by Van Cleef & Arpels, apparently collectively intended to represent separate gems (perhaps a contemporary update of Balanchine’s Jewels). This fact is also not mentioned in the Joyce program and publicity materials, making it appear as if Millepied prefers that the audience not be aware of this. If that’s the case, it was a wise decision. If it’s supposed to metaphorically represent the ‘emotions’ inherent in the nature or facets of a particular gem (here, I understand, the gem is an emerald), it doesn’t do that, although I might consider it differently in its trilogy context. On the other hand, On the Other Side works reasonably well as a standalone dance, even though ultimately it’s not as successful as it might have been. The dance’s initial, and visually striking, image is a nearly stage-spanning work of art created by Mark Bradford (credited for “Visual Concept”). The artwork (I’ll call it a painting, although I can’t be certain that that’s the case, or, if it is, whether it was painted on canvas or wood or some other backing) is a fabulous piece of abstract art that dominates the dance’s presentation. Bradford, who has collaborated with Millepied before (in 2012), is a well-respected Los Angeles-based artist (and winner of a “MacAthur Genius Award”), and the painting here illustrates why his work, when offered for sale, commands multi-million dollar prices. The skillful interplay of color, shape, form, and visual texture makes it one of the more vibrant pieces of contemporary art that I’ve seen. In a way, the flowing, multi-color and multi-form images that the painting presents look like the sand in “arts and crafts” sand bottles (remember them? ), but released from confinement and buffeted as if by a sandstorm across the painting’s space – and then when the colors became fixed on the canvas (or whatever the backing is) some of the pigment took the form of multi-colored dunes, and some of embedded mosaic tiles. To say it’s museum quality is an understatement; Millepied’s piece is worth seeing for Bradford’s work of art alone. The dance transparently plays off the painting – the simple costumes by Alessandro Sartori (tops and slacks, or, with respect to two of the women, mottled-color dresses) match the colors in the painting and have the same ‘windswept’ textural quality, so that the entire stage looks a unity (with the unfortunate exception of one scene). The result of this apparently carefully calculated and executed joint artistic effort led me to conclude, possibly erroneously, that On the Other Side is an attempt to make the artwork come to life. Such a theme is not unusual – indeed, it can be shopworn after a while – but as the piece unfolded I saw the dancers, and their costume colors, representing the interplay of pigment in the painting (forcing the viewer to look at the painting from the “other side”) – acquiring personalities, emotions, and movement qualities that enhanced the artwork. But then, the longer it dragged on, and despite some wonderful scenes (one involving Laura Bachman, Rachelle Rafailedes, Lilja Ruriksdottir, and Stephanie Amurao is particularly exciting to watch evolve), the more it started to fall apart. If the piece was intended as I initially thought, it should have ended at a point in the dance when the dancers suddenly stop moving and stand in place, fixed in position as the pigment in the painting is. Instead, the dance kept going. And going. And going. And instead of being a vivid re-conception and enhancement of the Bradford artwork, On the Other Side suddenly began to look like a contemporary take on Jerome Robbins’s Dances at a Gathering. Of course, Millepied is a former NYCB principal dancer, so some history with, and inspiration from, this Robbins piece would not be unexpected. 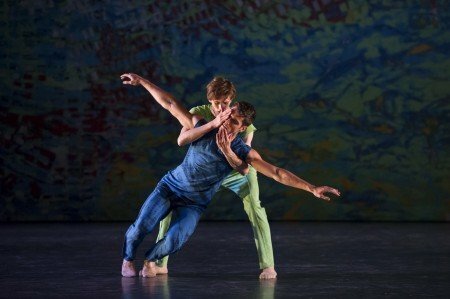 And Millepied’s choreography avoids the angst that permeates prior pieces of his that I’ve seen – his dances here (like Dances at a Gathering, On the Other Side is comprised of connected, but individual, dances describing different relationships) have a playful, contemporary lyricism. But at least based on this piece, Millepied lacks Robbins’s choreographic inventiveness and sense of humanity. With one or two exceptions it’s all too straightforward and matter of fact. And the Glass pieces, all piano, appear significantly more repetitious when grouped together as Millepied has chosen to do, than the Chopin piano pieces that Robbins used. And then there’s that one scene in which the painting is lifted out of the way, and dancers are illuminated solely by three spotlights installed above and behind them – which, though visually dramatic, makes no thematic sense in any context. The dancers, however, were as brilliant as the painting. Each one of the nine danced spectacularly. In addition to those mentioned, Julia Eichten, Morgan Lugo, and Robbie Moore particularly excelled. Peck does little that is not a success, and Helix, choreographed in 2014, is no exception. Commissioned to celebrate the 50th Anniversary of the Los Angeles Music Center, the piece features four pairs of dancers who dance together and then randomly shuffle through the course of the piece. This doesn’t sound particularly interesting, but in Peck’s hands nothing looks quite the same as anything that came before (either from piece to piece, or internally). Simply outfitted by Janie Taylor in blue-gray one or two piece costumes and nifty contrastingly-shaded blue socks, the eight dancers first appear with their backs to each other, and then scramble off. Nothing unusual there, but Peck doesn’t repeat himself except to make a choreographic point (as when he has couples swing across the stage upstage left to downstage right, sequentially, return to the original positions and repeat the process – it looks more exciting than that description reads). The dance is aided by a marvelous piece of music by former Los Angeles Philharmonic conductor (now conductor laureate) Esa-Pekka Salonen, which itself is an interesting contemporary work that eschews the trend toward endless repetition and builds to a climax, which Peck’s piece echoes. And unlike Millepied, who added more and more Glass excerpts to support more and more choreographic indulgence, Peck stops when the score does, and his choreography enhances and illuminates the music. My only hesitation with the piece is that it’s not particularly complex or memorable – but Helix is a well-crafted example of abstract contemporary dance. The less said about Harbor Me the better. According to the program notes, the three male dancers are supposed to represent not just guardians of a harbor (reflected by opening ‘waves-crashing-against-a-beach’ sounds and a confusing closing fog-bound image), but elements (fire, water, air) that interact and provide shelter to each other. Fair enough, but it’s difficult to glean that from Cherkaoui’s choreography. The bodies of the three dancers (Lugo, Moore, and Aaron Carr), all of whom do a super job with the intricate and angst-ridden movement), interact, and there are distinct forces (magnetic or otherwise) in operation, but predominantly this is an exercise in swirling bodies writhing within and around other bodies, or late in the piece, hands and upper arms forming complementary movements and patterns. At times the movement pattern briefly brings to mind ocean waves, but these few images are buried by the visualized emotional interaction between the three elements (and each element/dancer is given a solo with slightly different, but not different enough, emotional emphasis). And why, for no apparent reason, have the dancers remove their shirts, and then put them back on? At the end, a backdrop is lowered that looks like a sea fog except for a few vertical lines (masts? ), into which one of the three dancers hurls himself. After watching Harbor Me, I wanted to follow him. Finally, the premiere of Martha Graham Duets features three Graham duets (in order: White Duet, Moon, and Stars) that had not been presented on stage together before. The three pairs of dancers executed the Graham choreography reasonably well (though I suspect that Graham dancers would have captured Graham technique better), but presenting the three together enhanced none of them. Indeed, to me the duets not frequently seen (Moon and Stars) were stronger pieces than the more familiar White Duet which opened the series and is from the frequently performed (and wonderful in its entirety) Diversion of Angels – as if, in isolation, something quite critical was lost. Eichten and Lugo presented as a touching, albeit somewhat vacuous, couple in White Duet; Rafailedes and Nathan Makolandra danced the significantly more complex Moon superbly, and Amurao and Anthony Bryant knocked Stars into the stratosphere. Millepied apparently has big ideas about LADP’s direction now that he’s able to devote all his energies to it (having recently resigned as Artistic Director of the Paris Opera Ballet), including what appears to be a shared emphasis between balletic lyricism (if not ballet itself) and contemporary dance vigor, as well as, according to its “mission” statement in the program, continuing efforts to revive ground-breaking dances by influential choreographers. (It sounds like New York Theatre Ballet, with a significantly larger budget and significantly less local competition.) I note, for example, that Carla Korbes, another former NYCB dancer who recently retired from Pacific Northwest Ballet, is now listed as the company’s “Associate Director,” and Taylor (who attended the opening night performance looking as ethereal as ever) obviously has a strong artistic connection both to her former NYCB colleague and LADP. Should the two return to performing, the company’s artistic center of dance gravity may change as well. Be that as it may, L.A. Dance Project may ultimately succeed in finally putting Los Angeles on the dance map in a big way.